3.Scan TV channels and be ready to enjoy free HD TV! 1. Check to make sure you have correctly connected the antenna to your HDTV or third-party HD receiver. 2. Re-scan for channels: In the TV's setup menu, set the mode to indoor antenna or air. Refer to the TV manual for detailed instructions. 3. Reposition the amplifier antenna in a different location. It is suggested place it higher on a wall or closer to a window. Sometimes moving a few feet can make a difference. 4. keep the indoor antenna away from those big power consumption devices interference, such as air conditioner, refrigerator and microwave oven,etc. 5. This is an amplified TV antenna. If a signal cannot be received with the external amplifier, remove the antenna amplifier and try again. ★FREE FULL HD CHANNELS: No more need to pay extra bill for television. TV Antenna can access all of the news, sitcoms, weather, kids and sports programs free, like NBC, ABC, CBS, PBC, CW, CNN, FOX and so much more. ★UP TO 120 MILES RANGE: The indoor HDTV antenna can reach up to 100-120 miles and can be placed almost anywhere in your Home. Digital antenna constantly scans for new channels as they're made available for broadcast. Put the indoor antenna on a better position where owns better reception of your House. This 120 mile range skywire hdtv antenna enables you to watch local broadcast channels with high definition for FREE. ★HDTV ANTENNA 1080 HD: Amplified HDTV antennas high definition with booster- We adopt upgraded 2018 crystal clear filter technology to pick up signals within a huge range that reduces cellular and FM signal interferences, resulting in a clearer picture, low noise, and capable of accessing to more broadcast TV signals with enhancing range and frequency performance. ★EASY TO INSTALL: Takes only minutes to install this indoor tv antennas for digital tv and requires no technical backgrounding skills at all to set it up. 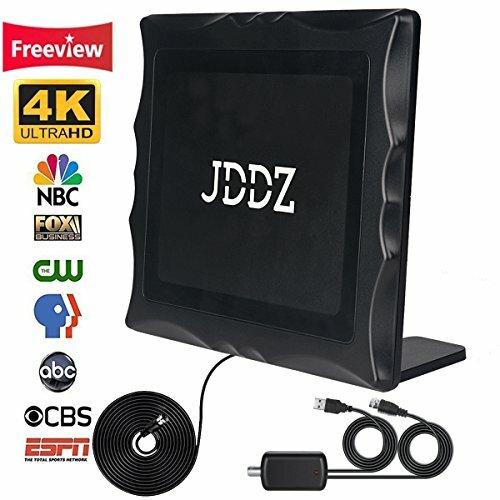 Just connect this hd antenna indoor antenna with your TV, scan for channels on your TV menu, This HDTV Antenna receives free broadcast High Definition Over-the-Air (OTA) TV signals, such as ABC, CBS, NBC, PBS, Fox, Univision and others. ★LIGHTWEIGHT AND SLIM: Lightweight with 16.4ft coaxial cable to make installation anywhere in the home extremely easy. You can put the antenna at many different spots at your home to get the best reception. If you have any questions about this product by JDDZ, contact us by completing and submitting the form below. If you are looking for a specif part number, please include it with your message.